After a success at auditions in December, three RBHS orchestra students traveled to Osage Beach Jan. 28 to perform at the Missouri All-State orchestra competition. 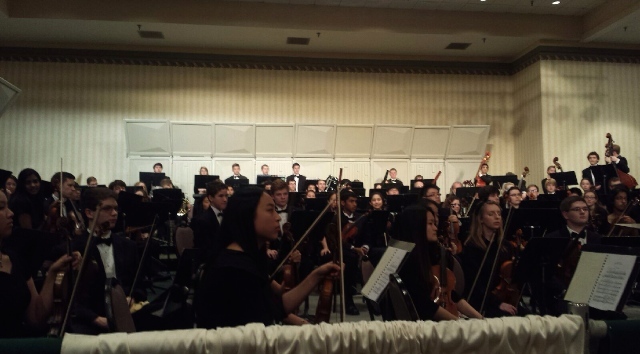 Juniors Alice Yu and Arnold Chen and sophomore Joanna Yu were among the RBHS students selected to All-State music. Chen, a violinist, said he felt anxious when he performed during the audition. The three Bruins split apart after reaching Osage Beach to audition for their chair placements. Afterwards, the whole orchestra came together for the first full rehearsal. Chen said the first rehearsal was messy because it was the first time people who didn’t know each other played together. Joanna Yu, who placed seven among 13 other viola players, said it was very exciting rehearsing with people you don’t know for the first time. After their rehearsals, all performers listened to a jazz band from New Orleans, Louisiana, as well as a motivational conductor from St. Louis. Yu said the process opened people’s eyes to possibility. Since this was Chen’s second time coming here, he said there weren’t that many differences. Harsh Singh is a junior and plays for the Rock Bridge tennis team.